A new contract for recycling, garbage and yard waste curbside collection will begin on October 1, 2017. This will change the collection day schedule for 59% of residents in Winnipeg, including the South Winnipeg-St. Norbert ward, which will now be serviced by GFL Environmental Inc.
Download the free My Waste app. Contracts with the City’s current garbage/recyclables contractors, Emterra Environmental and Progressive Waste Solutions, expire September 30, 2017. The work was put up for tender by the City and awarded to GFL Environmental Inc. and Miller Waste Systems Inc. The new contracts run from October 1, 2017 to January 31, 2025. Starting the week of September 18, 2017, all cart collection customers will receive a notice by direct mail, confirming their collection day, whether or not their collection day changes. Customers can also find their newly-assigned collection day by visiting www.winnipeg.ca/collectionday and entering their address. From that point, they will be able to view their collection calendar and print a 1-month, 2-month or 6-month calendar. The City will no longer be printing/distributing collection calendars. If a customer does not have the ability to print a calendar, contact 311. Customers will also be able to set up collection day reminders through this page, to ensure they never miss a collection. This is helpful for bi-weekly yard waste collection, as the Spring 2018 yard waste collection dates will not be added to the calendar until a start date for yard waste collection is selected. If customers want to see both their current and newly assigned collection days are, they can do so by visiting www.winnipeg.ca/ecis. Another great tool is the MyWaste app, which allows customers to see their collection schedule, set up reminders and find out what to do with unwanted material. Customers can download the MyWaste app from either the App Store or Google Play. Links can be found on www.winnipeg.ca/mywaste. Some customers may have more than one week between collections during the first week of October, 2017 (i.e., customer’s collection day moves from Tuesday for the last week of September to Friday for the first week of October). Most customers will be able to accommodate additional material in their recycling and garbage carts for those extra few days between collections. Customers who are concerned that they will not have enough cart space, because of the longer period between collections, should contact 311. Why are some collection days changing? A new collection contract is starting October 1, 2017. 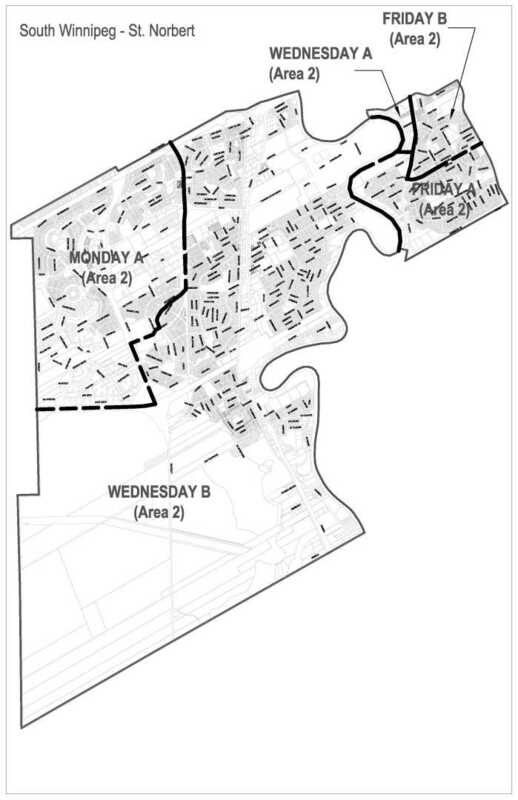 The city will be split into two collection areas, with a different contractor servicing each area. Collection days have been adjusted to improve efficiency. Please remember to put your carts out by 7 a.m. on your new collection day. Can I request to change my collection day? No, the collection days have been set to maximize efficiency. 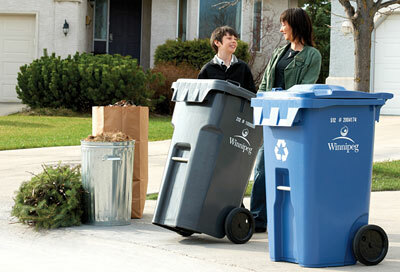 Will there be any other changes to my recycling, garbage, or yard waste collection service? Your recycling, garbage and yard waste collection service will stay the same. What do I do if my collection is missed? If your collection is missed, please call or email 311 after 6 p.m. on your scheduled collection day. NOTE: To see a high resolution map, click HERE.